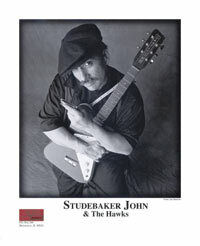 Studebaker John & The Hawks will perform in Warsaw, April 26 and Chorzow, April 28. In between they return to the Czech Republic on April 27. 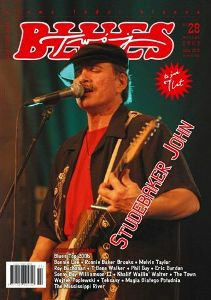 John is the featured artist in the April edition of the Two Blues magazine, a large publication in Poland. The band returns to Lithuania for 2 big shows. April 30 in Klaipeda and May 2 in Vilnius. From Poland: He keeps getting better and better and that doesn't happen to often. His guitar playing with the slide on his finger is very powerfull so is his harp plying. With a tight rhythm section that makes a great CD! It will be my pleasure to feature his music in my shows. I'm sure my listeners will enjoy it as much as I do. From Midnight Blues - the #1 internet radio show: Self-Made Man hits the road with the kind of gritty traction we’ve come to expect from the Studebaker—lots of torque with John’s own brand of raw rock guitar-sliding Blues. This new album says ‘get out of my way’--’cause I am what I am. It’s dark and edgy, with lots of shot-gun pieces with a tough background garage beat like a bar of solid metal pounding underneath you. John’s been in the Blues music world a long time—he played Buddy Guy’s Southside Checkerboard Lounge in the late ‘60’s—and he proves that there’s a hell of a lot of strength can come out of experience. Self-Made Man is solid and powerful--and won’t leave you standing still! "His raw amplified canonical work recalls past masters like Little Walter and Big Walter Horton, while his slide guitar style is descended from the styles of Elmore James and Hound Dog Taylor. 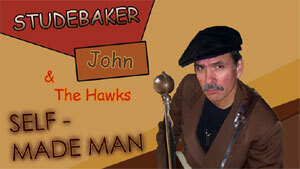 On top of that Studebaker John is a powerful vocalist and talented songwriter…"
You can buy Self-Made Man at fine retail stores such as Borders, Tower Records and online at Amazon.com, Best Buy, or directly from John at Studebakerjohn.com.